AZFlow copyrighted controls are provided to meter water onto the cooler. To accomplish this, cooler inlet air temperature and relative humidity are sensed and used by the control system to determine the inlet wet bulb temperature and the water evaporation rate. Once the evaporation rate is determined, it is combined with the client specific water chemistry analysis results to determine the quantity of water that must be added to end with water leaving the media at the desired cycles of concentration. AZFlow coolers are unique in that they are the only evaporative coolers available with the combination of installed sensors, control, and computing capability to effectively monitor and manage key aspects of their own performance. For example, the coolers are set up to implement compensatory measures to account for calibration drift and the failure of sensors and other physical components such as the failure of the inlet humidity sensor or clogging of a drain line. In the case of the failed humidity sensor the system uses the current date and an associated range of expected values along with the calculated inlet wet bulb and outlet wet bulb to validate the sensed values. If the sensed values do not satisfy this assessment, an alert and an alarm are sent and a conservative set of values for the current calendar date is used by the control system as the basis for the water application rate. This capability allows the cooler to continue operation without scaling and thereby avoids the need to shutdown the unit for maintenance until a convenient time and a time that appropriate spares are available. For systems where internet connections are available the system uses temperature and humidity information from a control site to set the water application rate. With these capabilities few failures or events result in the shutdown of the unit. Additionally, this capability provides operations and maintenance personnel with information, trends, and computer aided guidance to maximize the performance of the coolers in your local environment. For facilities with multiple cooler applications the cooler control systems are integrated providing the opportunity to eliminate duplicate sensors and associated modules. Interface with the control system is through a web browser with the control system integrated into your local area network or accessed as a stand alone local area network using an individual desktop or laptop computer. The copyrighted control package is written in Red Hat, Apache, SQL, and other commercial packages that have been around long enough to have a significant core of personnel trained in their application and readily available packages that are royalty free. The system has been designed to interface with building energy management systems through a combination of pass through pop-up menu screens and variable database tables. The control system is secured and administered through an encrypted, multilevel, password protection security package. This system is locally administered to control access to various cooler functions and parameters. The levels from least to most secure are: Monitor, Operator, Technician, Administrator, and OEM. The Monitor level is a read only level with access to Overview, Status and Status Table, Alarm Log, Troubleshooting and Trending. Operator level has access to monitor level functions and the Alarm Response screen. Technician level has access to operator level screens and the configuration screen where alert addresses; alarm point values; cooler rinse cycle values; and compensatory action parameters are stored and selected. (Note that: default values and limits controlled as OEM). The administrator is provided both with access to all functions and the capabilities to administer passwords, assign access levels, and determine routing for alert messages. Unit Status screen - This screen provides a snapshot of current cooler performance. Values for all parameters and positions of all switches are shown on the chart. Temperature out of range - This alarm is used to make the operator aware of inlet or outlet temperature sensor reading out of its normal range. Such an indication occurs when the instrument is grounded or open. Humidity out of range - This alarm is used to make the operator aware of humidity sensor reading out of its normal range. Such an indication occurs when the instrument is grounded or open. Low unit efficiency - This alarm is used to make the operator aware of unit efficiency less than its normal range. Such an indication occurs when the unit is not wetting properly. Troubleshooting screen - This screen provides recommended steps for troubleshooting alarms and performance problems. 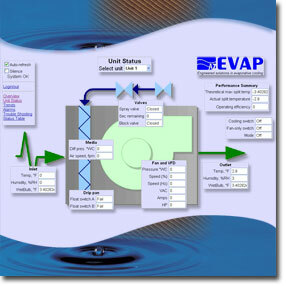 Status table screen - This screen provides a tabular view of cooler information such as inlet temperature, humidity, outlet temperature, unit efficiency, drain pan level switch status, valve status, cycles of concentration setting, spray valve status, rinse cycle settings, and many other parameters. Configuration screen - This screen provides a tabular view of current cooler configuration settings. Performance trend screen - This screen provides the ability to select various combinations of the cooler parameters to be graphed and then allows the operator to select the time scale (1 hour, 12 hrs, 24 hrs, 7 days, 30 days, 90 days, and 1 year) for the graph being evaluated.